> OnBase by Hyland > Is your organization digitally transforming or stuck in neutral? How far along is your organization on the journey toward digital transformation? 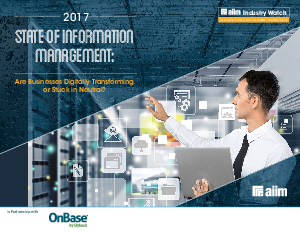 AIIM’s Information Management: State of the Industry 2017 report highlights the current state of the industry and how different information management strategies support progress toward digital and business transformation. Include these valuable insights when considering your go-forward IT strategy. Find out where your organization stands, and put your digital transformation in drive.